The global injectable drug delivery devices market is expected to increase from around $11.6 billion in 2013 to around $ 17.5 billion in 2018.1 Growth is being attributed to the rising prevalence of chronic diseases, the biologics market, technological advancements, and demand for self-injection devices, which are expected to experience the highest growth rate of 16.1%. With the growth of the biologics market, four of the world’s top-five selling drugs are delivered by injection. Because these drugs are complex, biologics often require robust design efforts and present delivery challenges. 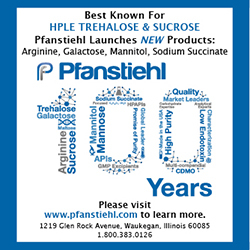 “There is a challenge with how to best deal with high-volume injections and highly viscous biologic drugs,” says Terence O’Hagan, General Manager, Haselmeier, Inc. In addition to wearable devices, experts see a trend toward connected devices. Here, a device is connected to a smartphone and tracks and reports injections to doctors and healthcare providers. The connected smartphone may remind the patient when to take the next injection, improving compliance, and if the patient forgets to inject, the caregiver could receive an alarm from the system. –Connection between the device and smartphone must be established by Bluetooth or near-field communications (NFC). Bluetooth is too expensive to integrate in a disposable device and NFC doesn’t have far enough reach. –It is not feasible that a disposable device has its own electrical power. The power must come from the smartphone or another device. –IT infrastructure needs to be built, and a cloud solution needs to be provided, to save and share the data. “These challenges show that communication technology has to advance and that many more questions will need to be solved before disposable devices with integrated connectivity will be ready for the market,” says Mr. Michel. Until connected devices reach maturity, device developers will continue to seek more mainstream ways of enhancing the injection experience. Many are turning to Human Factors Engineering. Universal: They will operate with any primary container without the need for a drug transfer step. Customizable: Embedded electronic features will allow customization depending on the intended user type. Upgradable: Connectivity capabilities will allow devices to be remotely upgraded, making the task of lifecycle management easier. Green: Devices will further align with the increased requirement for greener technologies. Energy harvesting technologies will replace batteries and make the end-of-life management of devices much easier and greener. Empowering: Injectors will allow patients to take control of their disease state by monitoring their drug performance and recording relevant everyday activities. Access to real-time and historical data will empower patients who want the ability to better manage their disease state. Drug delivery devices will also be able to give feedback to patients and this information will be followed up with instructions on how to improve. Intelligent: Delivery devices will be able to distinguish between the different types of drugs they deliver, how much they deliver, and when they deliver them. They will be used as authentication devices for drugs administered, providing extra control to the supply chain of drugs. Likable: Drug delivery devices will adopt design features that resonate with patients and increasingly look more like consumer accessories. Extended Shelf-Life: Devices will have limited features that may limit their shelf- life and constrain the manufacturing and supply processes of manufacturers. Drug Development & Delivery recently asked some leading device developers to describe their current injection technologies and explain how these devices are addressing the aforementioned trends. Bespak works closely with biopharmaceutical partners to develop customized device designs that are suited to the needs of specific patient groups. Those designs reflect inputs from a range of key experts and stakeholders, including healthcare professionals and patients. Data generated in-house and by the company’s biopharmaceutical partners’ studies are also considered. 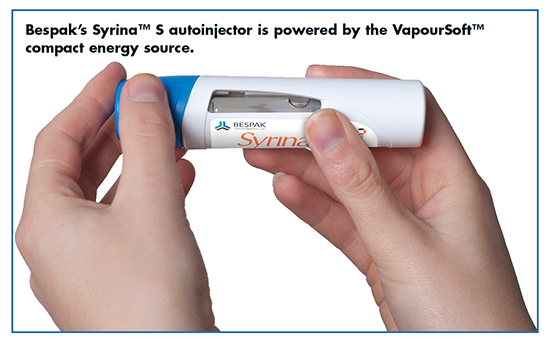 Bespak has refined its VapourSoft™ powered Syrina™ autoinjector range of devices. The Syrina S autoinjector design is now platform-ready and suitable for 1-mL/2.25-mL prefilled syringes. The Syrina AR autoinjector, featuring automatic insertion and automatic retraction, will be available toward the end of this year. Devices also need to accommodate the most common primary containers. Most of Bespak’s devices are designed to allow for universal standards and ensure that if the body of the device needs to be changed for different patient groups, one device could easily be used for a number of different injectable products. Additionally, Mr. Kaufman says the VapourSoft range of devices addresses issues of injection volumes and higher viscosity liquids to allow self-administration. Looking ahead, he says that partnerships will become increasingly important to ensure the need for injectable devices is met. By working with its sister company, Aesica, Bespak is beginning to support its customers with a complete offering from start to finish, as well as with drug-device combination products. Additionally, manufacturers must plan and manage the full life cycle of their products with the goals of getting to market fast, maximizing market share, and extending useful life. To address these competing demands, biopharma manufacturers need a platform of injection devices that provides suitable options at each stage along the life-cycle spectrum, while ensuring consistency in use, market differentiation, and compliance to needlestick safety and reuse prevention mandates, says Mr. Merhige. 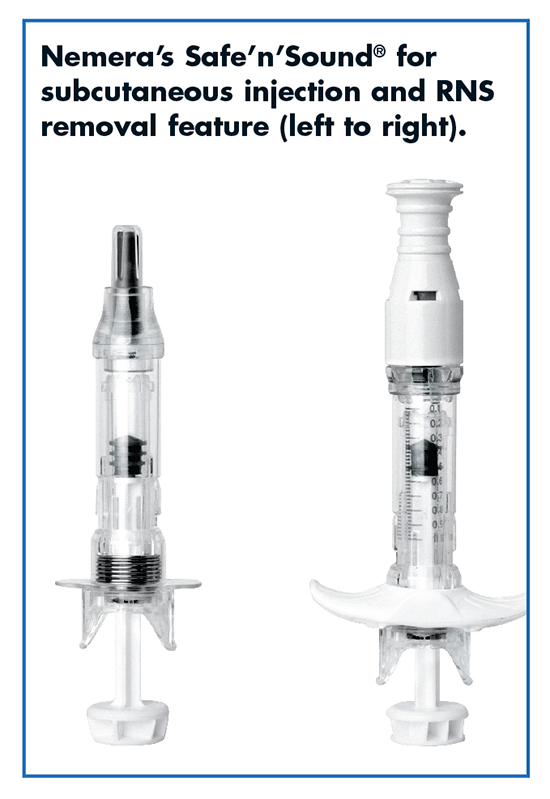 The Credence Companion platform of reconstitution devices shares common themes across the products: the user completes the injection (marked by an end-of-dose click) and then the needle automatically retracts through the stoppers and into the plunger rod and syringe barrel, preventing the syringe from being reused. However, each product can play a different role in a manufacturer’s strategy and a drug’s life cycle. The Luer Companion is the most straightforward to implement and most closely resembles conventional reconstitution as the user delivers the diluent into a drug vial and draws the reconstituted solution back into the syringe. Credence’s needle retraction technology allows this mixing procedure to occur without any potential for premature activation of the safety mechanism. The added benefits of the Luer Companion include needle-connection security, end-of-dose cues, passive needlestick safety, reuse prevention, and component reduction. Additionally, because the drug manufacturer can choose from readily available syringe and elastomer primary package components, and because Credence components do not interface with the drug product during storage, the development and regulatory path to market is shortened and simplified, says Mr. Merhige. Credence has extended the platform to include the Companion Dual Chamber Reconstitution Safety Syringe for drug manufacturers looking to enhance and simplify the user experience in a market where delivery of healthcare is moving to the home and injection of medication is increasingly performed by self-injectors. Consistent with Credence’s Innovation Without Change design philosophy, the Companion Dual Chamber uses a standard uniform diameter glass barrel (syringe or cartridge), standard stoppers, and standard needle shields. When using the Companion Dual Chamber, the user presses on the plunger rod to mix the two components that had previously been separated; the diluent in the rear chamber passes into the front chamber through a newly formed channel in a standard stopper. DALI has performed a market research study with patients and healthcare providers (HCPs) to uncover patients’ preferences between autoinjectors and prefilled syringes. The survey was intended primarily for individuals experienced with self-injection or caregivers and HCPs administering injections in three main applications: diabetes, Multiple Sclerosis (MS), and Rheumatoid Arthritis (RA). The study results showed that a significant percentage of patients prefer to control injection speed and benefit from the ease of use of autoinjectors. A drug delivery device that combines the ease of use of an autoinjector with the pain level similar to prefilled syringes (by manual control of the medication injection speed) would be advantageous, explains Mr. Daily. 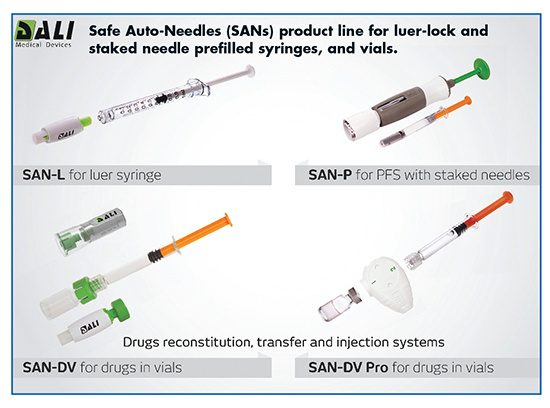 The SAN product family is designed for improved patient compliance and adherence to treatment: All SANs reduce needle phobia, anxiety, and pain perception by hiding the needle, ensuring consistent needle penetration depth and angle, preventing needlestick injuries, and allowing for user-controlled injection speed for increased comfort, says Mr. Daily. The most recent developments are the SAN-DV and SAN-DV Pro. Like an autoinjector, SAN-DV and Pro reduce patient anxiety and are easy to use, says Mr. Daily. Additionally, SAN-DV and Pro simplify the reconstitution process and drug transfer from vials, and allow the patient to control the speed of the injection. Target applications include all drugs in vials – either liquid or lyophilized. –Likable – the SAN family was found likable and desirable in several formative usability studies by both self-injecting patients and HCPs. 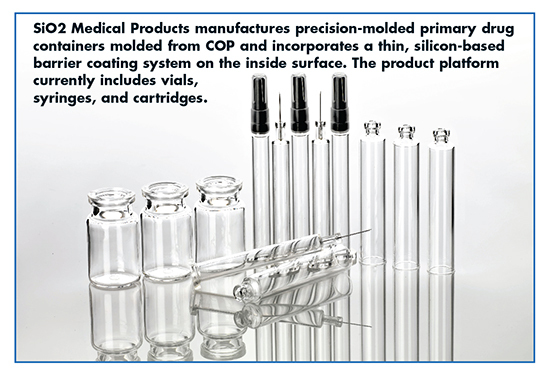 Gerresheimer Medical Systems produces prefillable syringes and cartridges (primary packaging) made of glass and plastics, as well as customized injection-molded plastic assembly units like insulin pens and autoinjectors. Gerresheimer plastic experts work with glass specialists to coordinate the tolerances of glass carpules and plastic parts to ensure that injection forces are optimized and that carpule and syringe are positioned optimally in the plastic device. Gerresheimer currently offers a range of prefillable Cyclo-Olefin-Polymer (COP) syringes produced by long-time partner Taisei Medical Co. Ltd. in Japan. 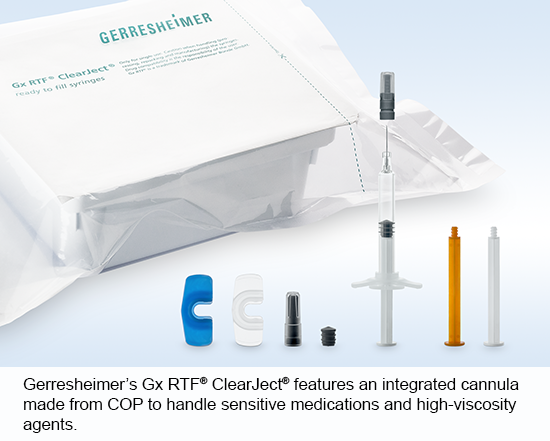 In June 2016, Gerresheimer introduced the Gx RTF® ClearJect® brand, a prefillable plastic syringe with integrated cannula made from high-performance plastic COP for sensitive medications and high-viscosity agents. In the future, American and European customers will be offered COP syringes produced at the German production facility of Gerresheimer Medical Systems. “COP is an interesting plastic alternative to glass syringes due to the growing demands of novel agents on their primary packaging,” says Claudia Petersen, Global Director Business Development, Gerresheimer Bünde GmbH. “COP syringes are resistant to breaking, are as transparent as glass, and hardly interact with the packaged medications. Thanks to the use of injection molding, the design boasts especially tight tolerances. Its precise geometry also reduces dead volume, leaving behind less of the expensive medication in the syringe.” Additionally, COP has a high pH tolerance and, unlike glass, does not change the pH value while in storage. The new 1-mL Gx RTF ClearJect syringe is siliconized with a precisely controlled amount of high-viscose silicone oil, which generates lower amounts of subvisible silicone oil particles while providing good functionality, says Ms. Petersen. The design is inspired by ISO 11040-6 and the syringe is equipped with a 27-gauge, 1/2-inch (12.7 mm), thin-walled stainless-steel cannula with three bevels. Ms. Peterson says the new syringe is economical because the COP body is designed to use commerically available components. This begins with the use of standard cannulas and continues with the piston rods, piston plungers, backstops, and closure systems. A detailed pre-development process is used at Haselmeier to properly evaluate the technical requirements and create devices that are easy and intuitive to use. This structured process allows for engineering and design exploration, as well as Human Factors testing, to verify that the product design will be effective. Combined with a final risk assessment, a complete package is then released for full-scale development. Haselmeier integrates a range of drug cartridges into its pen devices for both disposable and reusable systems. “Understanding the design elements and tolerances of the primary containers and their impact on the device performance and accuracy is paramount when integrating a new package into an existing device,” says Mr. O’Hagan. For example, the crimp and stopper dimensions in a 3-mL cartridge must be accounted for, and adjustments in the device made, to deliver an accurate dose and expel the appropriate volume. This integration starts early with the execution of a pre-testing program of cartridges before the execution of the platform development. Haselmeier has announced several new products, including the Axis-D disposable pen, the D-Flex disposable device, and Connected Pens. The D-Flex device is designed to provide a high level of dosing flexibility. “Our initial objective was to design a pen that could be used to inject any dose comfortably, and in which it was possible to set several dose values in steps of any size, without having the annoying intermediate values. There was, and is, no such pen on the market yet,” says Joachim Keitel, Head of Strategic Innovation at Haselmeier. The D-Flex allows for the selection of a series of pre-selected, regular, or non-regular random doses and is designed to prevent the patient from selecting any interim doses. 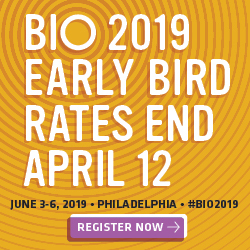 “The device is appealing to partners with a range of drugs to treat chronic diseases, new biologics, and orphan drugs with very specific dose regimens, and companies developing biosimilars that want a device that improves upon existing devices and can be delivered cost effectively,” says Mr. O’Hagan. Haselmeier’s device portfolio is based on specific technology platforms that can be tailor-made for specific drugs and patient populations. For example, the iPen platform delivers insulin, HGH, and parathyroid hormone along with new variants being developed to deliver drugs with orphan designations. And, the new D-Flex platform provides a flexible device where a dose regimen can be changed by modifying a single component. He explains how one customer was looking for a reusable device to deliver a low-volume fixed dose. In addition, the drug was lyophilized and required reconstitution within a two-chamber cartridge. The indication was to treat a small patient population leading to low device volume requirements. Because of this, leveraging an existing device platform would be more cost effective. Haselmeier leveraged its iPen technology platform and created a dose limiter within the device set at the specific dose volume, and adjusted the piston rod to accommodate the length of the cartridge and stopper position. A partner provided a mixing device to reconstitute the drug prior to inserting it into the pen. Finally, the client needed to provide the drug in a range of concentrations. A solution was developed where each concentration was delivered to the patient directly in a color-coded cartridge container. The patient assembled the cartridge container onto the mixing device for reconstitution and transferred the entire container directly to the pen. This simplified the handling procedure with the patient and minimized the potential for errors in using the wrong concentration. Haselmeier is developing connected technologies that can be applied across its device portfolio, which will allow customers to deliver intelligent solutions for clinical trials, commercial use, or both. “We believe digital medicine can be achieved through intelligent integration of electronic technologies into our existing products versus redesigning our portfolio to meet those objectives,” says Mr. O’Hagan. With an increasing number of biologics and therapies, pharmaceutical and biotechnology companies face challenges in ensuring the efficacy of a drug, and that patients will comply. This has paved the path for a new future of subcutaneous delivery with a need for intelligent, smart, wearable delivery systems. Additionally, there is also an increasing focus on patient centricity — enabling patients greater freedom to live their lives without being restricted by their drug delivery regimen. There is also an increasing focus on patient centricity, enabling the patient greater freedom to live their life without being restricted by their drug delivery regimen. He continues to explain that the Omnipod platform can modify dosing and delivery times, as well as monitor patient adherence. Additionally, the Omnipod has a remoteless option for preprogrammed dosing regimens. Its auto-cannula insertion means patients never have to handle the insertion needle. 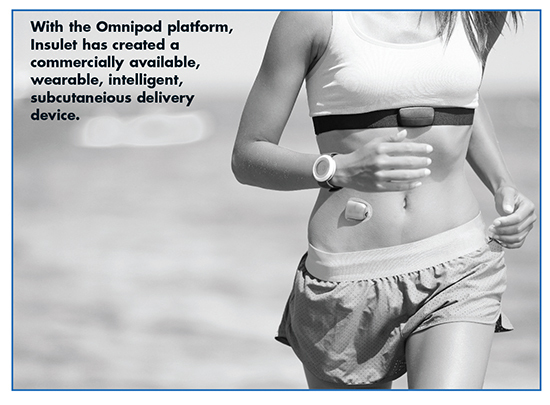 Omnipod is discreet, tubeless, and waterproof to help reduce life interference and improve drug adherence. Medipacs has developed a patent protected, injectable drug delivery technology that is precisely controllable and fully programmable. Medipacs devices are low-cost, low-profile, disposable infusion devices used to deliver drugs subcutaneously, explains Mark Hassett, Vice President, Sales and Business Development, Medipacs, Inc. 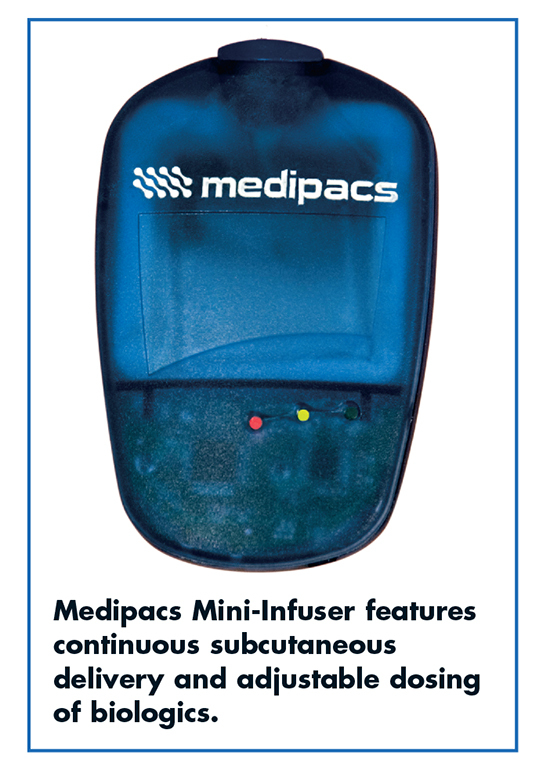 Many existing markets (and therapies) can be served today by the Medipacs Mini-Infuser. The patient does not need any special training to use the device, as it is preset to deliver a precise amount of drug to the body over a controlled period of time. The technology delivers biologics, insulin, hormones, fertility, anti-coagulation, oncology drugs, pain medications, proteins, and peptides. “Many of the next-generation biologics will require larger-volume injector systems, which the Medipacs Infuser can also accommodate,” says Mr. Hassett. Medipacs wearable device technology platform offers advantages over other wearable devices, explains Mark McWilliams, Medipacs CEO, such as continuous rate, bolus rate, adjustable dosing, and field fillable options. Looking ahead, an Investor Forum Posting (Dec. 2013), entitled Next Big Thing In Drug Delivery, states that wearable injectors will be the newest and most appropriate injectable devices for the delivery of the biologics that cannot be administered by patients with standard handheld devices, and further mentions research that estimates more than 350 million wearable devices will be used by 2024. Parenteral is often considered as the default route of administration, but is also known as a non-intuitive process. To respond to these issues, Nemera has developed Safe’n’Sound®, a customizable platform of add-on passive safety devices for prefilled syringes, which aims to prevent potential needlestick injuries and facilitate the injection process. The safety feature activates automatically at the end of the injection, easing the use. User interface was integrated at the beginning in the design and development, integrating ergonomic features: a large thumb pad surface to smooth the injection; large built-in finger flange to facilitate handling; a round shape for easy and comfortable handling; a spring located at the syringe flange position to provide good visibility of the tip of syringe; and able inspection of the drug even with low-filling volume drugs. Optional add-on ergonomic extended finger flanges have also been developed to improve the handling, gripping, and comfort for the user, explains Adrien Tisserand, Global Category Manager – Parenteral & CMO, Nemera. Nemera has also developed a specific version of Safe’n’Sound for subcutaneous injection. This version has only the correct needle length exposed to ensure the drug is administered as intended. And, as rigid needle shield (RNS) can sometimes be a problem, Nemera looked into a technical solution to facilitate RNS removal. The company also developed a 2.25-mL version of Safe’n’Sound for self-administering large-volume, highly concentrated, viscous drugs. A new generation of two-step autoinjector has also been developed for fluid and viscous injections. The SafeliaTM autoinjector has been designed to ease the self-injection experience. Safelia delivers formulations in glass syringes, from fluid small molecules to challenging highly concentrated biological formulations in subcutaneous or intramuscular layers. Noble has developed and launched many new autoinjector and prefilled syringe training devices using a device-comparable approach. This approach means training devices are engineered to replicate the same form and functionality as a real device, including functions like plunger speed, needle simulation, safety mechanisms, and additional technologies that improve proper use and memory recall. 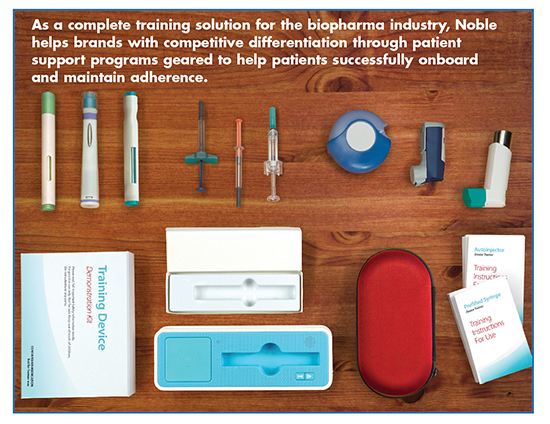 Noble has been involved in many new drug launches, helping brands differentiate themselves through patient support programs. By creating solutions that limit errors, adverse events, complaints, and poor compliance, Noble helps pharma brands overcome the challenges many face with HCP brand preference. The regulatory pressure to increase awareness about safety raised the concern on preventing needlestick injury. Therefore, safety injection devices have gained increased attention from healthcare professionals and manufacturers. The accelerated emergence of regulatory controls over the past few years has pushed manufacturers to come up with new product design and integrated safety systems to meet the requirements. In response to needs for improved user safety and injection conditions, Ompi, together with Balda, have developed a needle protection system for prefilled syringes that requires no modification to the primary drug container and do not need additional assembling lines after fill/finish process, being directly integrated with the sterile, ready-to-fill syringe. “Its functionality is fully passive, and it is the first such device to provide full needle shielding pre- and post-injection. This Ompi ISS (Integrated Safety System) syringe platform is completely integrated in the existing Ompi EZ-fill RTF portfolio. This means the use of a standard nest-and-tub packaging compatible with the existing filling lines. In addition to an improved safety level, the Ompi ISS solution grants a usage experience that is very close to a regular ‘naked’ syringe,” says Paolo Golfetto, Technical and Business External Relations of Ompi. The biopharma industry faces new challenges with large-molecule biologics. In particular, a large volume of a viscous solution requires special care to ensure proper dosing and customized injection devices. A more complex therapy regimen risks lower adherence and persistence rates and ultimately reduced patient outcomes. 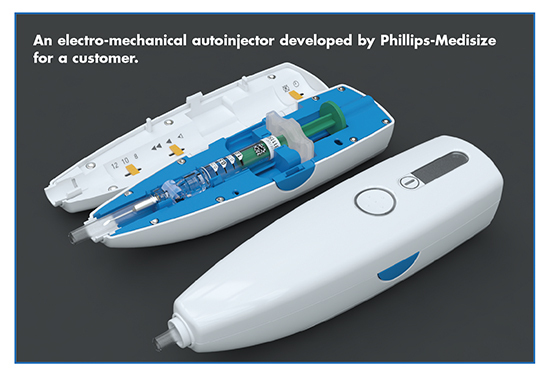 Phillips-Medisize focuses on the development and manufacture of injection systems that improve therapy adherence and persistence in terms of injection speed, dose volume, and date/time of delivery. “As a contract designer, developer, and manufacturer, we work closely with customers to develop and manufacture a range of injection devices, from mechanical autoinjectors and pen injectors to microneedle injection devices, needle-free injectors, and electro-mechanical injectors for various therapies,” says Bill Welch, Chief Technology Officer, Phillips-Medisize. Having a strong background and history in device strategy enables Phillips-Medisize to understand user needs and find ways to optimize the therapy solution. One example is a connected health solution for a leading pharma customer who asked the company to create a device strategy for a mature Multiple Sclerosis drug. The strategy work identified an opportunity to deploy a connected health solution. The outcome was an intelligent injection system to support treatment adherence. It consists of an electromechanical connected autoinjector, a software application for patients, and a dashboard for physicians and nurses that securely displays user treatment data from the system’s software cloud. “We developed the first range of conceptual designs based on a draft target product profile document received from the customer expressing some of the key ideas and mandatory requirements,” explains Mr. Welch. “We were responsible for the conceptual program and the subsequent full development program. From the start, there was a clear strategy that we would develop the product (device) and connected service, manufacture it, and supply to the customer the complete packaged product ready for distribution to global markets.” In this and other projects, Mr. Welch says the company’s philosophy of a successful design must be usable, intuitive, and desirable to minimize risk of error, increase adherence, and ensure the device fits into the user’s lifestyle. Traditional borosilicate glass syringe barrel and plunger components have been implicated to introduce unwanted interactions between the therapeutic drug product and component materials. For example, silicone oil has been reported to denature proteins and form protein aggregates. Similarly, leachable metal compounds can oxidize and aggregate proteins. SiO2 Medical Products has taken a system approach toward addressing unwanted interactions between therapeutic drugs and their packaging. The syringe barrel is composed of a medical-grade COP coated with an inert and dense silicon-based barrier system that does not allow leachable and extractable compounds to interact with the drug formulation, explains SiO2’s Chief Scientist, Dr. Christopher Weikart. “Similarly, an innovative plunger was developed that eliminates silicone oil and provides an inert and leachable-free drug contact surface.” Vial, syringe, and cartridge products are highly customizable due to the inherent flexibility of both the molding and coating processes. “Each product meets the highest level of dimensional tolerance that cannot be achieved by traditional borosilicate glass processing,” says Dr. Weikart. The vacuum-based plasma coating process is highly adaptable to complex shaped articles irrespective of packaging size and aspect ratio. The coating system, which is about 250 times thinner than a human hair and completely conformal, has an insignificant impact on the dimensions and internal volume of the packaging. Human factor considerations are playing an ever-increasing role as novel drug delivery systems are coming to market. Healthcare professionals, patients, and caregivers need to safely prepare, place, activate, and remove the device with minimal difficulty. The SenseCore technology allows for single-button operation with visual and audible signals that are easy to understand, says Sandra de Haan, Head Business Development at Sensile Medical. The user interface can also incorporate a colored touchscreen display, multiple language packages, etc. The devices can be pre-programmed for the desired drug delivery profile at the time of manufacturing. Alternatively, if the therapy requires a weight-based delivery, adjustment programming can be done by the doctor or patient. “Sensile Medical offers early stage compatibility testing to de-risk the compatibility issues from the start,” explains Ms. de Haan. “Materials in contact with the drug product are carefully chosen and undergo all necessary testing.” Sensile Medical has developed a micro-pump, which is the heart of all of its devices. Its next product will be a large-volume body-worn patch pump for its partner scPharmaceuticals with Furosemide. “The overall objective for the development of the device was to offer the most advanced features for safety and convenience, with the cost and utility of a disposable product,” says Ms. de Haan. SenseCore technology allows for the development of a small two-component device comprising a single-use disposable unit and a reusable unit. This concept offers several advantages: The design of the disposable unit enables a cost-efficient, high-volume production process, she says. Using just two plastic parts for the SenseCore technology supports keeping the costs at a low level. Additionally, the priming process is automatic and does not require separate handling steps. This integrated feature increases safety, saves time, and helps prevent errors by HCPs, patients, and caregivers, Ms. de Haan says. In 2005, Terumo® launched the 33 gauge (G) x 4 mm Nanopass pen needle (not available in US and Canada) to provide better injection comfort for diabetic patients who have to self-administer daily insulin injections. This micro-tapered needle had larger diameter at the distal end and a smaller diameter at injection tip. 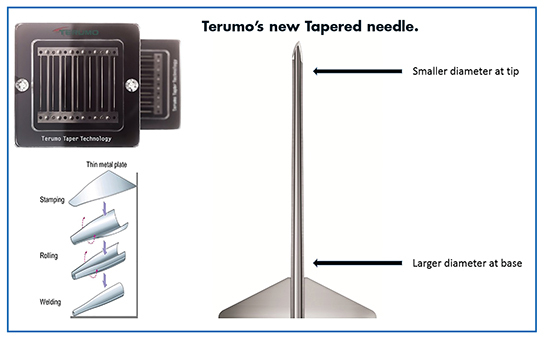 Based on the same principles, Terumo launched the 34G Nanopass (not available in the US and Canada) pen needle. The impact of a tapered needle is significant as formulation scientists can load more drug into the formulation, which may reduce the frequency of administration, says Dr. Bose. “Usually higher concentration of drug leads to higher viscosity. The formulation either needs to be diluted or large-volume injectors are required. Tapered needle technology combines the effects of diameter and length to provide lower glide forces for viscous drug products, including concentrated protein biologics. For example, 29-24G tapered needle has 24G needle at the base and 29G needle tip. This gauge reduction in needle size facilitates reduction of the glide forces during injection. The 29-24G taper needle reduces glide force by approximately 46% when compared with same gauge straight needle for viscous biological product. “This novel needle technology may be used to achieve better patient compliance with a smaller needle at the tip when injecting viscous drug products,” she says. Terumo aims to deliver medications safely and reliably, ensuring the efficacy of treatment, patient adherence and outcome, while minimizing patient trauma, pain, and discomfort, she says. To achieve that goal, Terumo offers a “pain evaluation service” that helps pharmaceutical companies optimize their drug formulation (eg, pH, ionic strength, viscosity, etc.) and device variables (eg, needle size, speed of injection, angle of injection, etc) to reduce pain from injection in patients. With Terumo’s “pain evaluation service,” quantification of pain from needle insertion and/or drug injection in animal models allows pharmaceutical companies to understand the pain experiences during injection. The Tapered needle can be used with PLAJEXTM syringes. 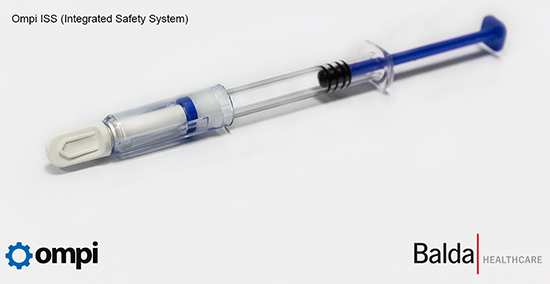 PLAJEX (COP polymer syringe) is a ready-to-use prefillable syringe with i-coatingTM technology on the plunger stoppers to create a silicone oil-free system. It is also free of tungsten and glue and has low sub-visible particles. These advantages can decrease the risk of protein aggregation in biologics. At the same time, the use of steam sterilization can reduce protein degradation through oxidation (which can happen from sterilization by irradiation as a result of free radicals generation). PLAJEX is available with or without tapered needle. The PLAJEX and tapered needle combination can provide better drug/device compatibility, says Dr. Bose. With the continued emphasis on biologic drugs, and the assumption that most of them will require injection (in many cases by the patients themselves), West continues to focus on improving the “patient experience” through a combination of four key elements: 1) a thorough understanding of patient/user needs; 2) the design, development, and manufacture of patient-centric delivery systems; 3) ensuring effective training and onboarding; and 4) encouraging and tracking adherence. As an example, a recent study by patient onboarding company Noble, and analyzed by Auburn University, found that more than 60% of patients self-reported that they did not thoroughly read the required steps outlined in a self-injection system’s “Instructions for Use” document prior to beginning drug treatment. By not following instructions, there is significant potential for administration errors that can impact compliance, which can have a negative impact on a patient’s care, says Graham Reynolds, Vice President and General Manager, Biologics, West Pharmaceutical Services, Inc.
To address this area of the adherence challenge, West and Noble have teamed up to offer validated training for all self-administration systems to West’s pharmaceutical and biotechnology customers. In the training, West brings its expertise in human factors testing and analysis to the design of drug delivery systems, and Noble incorporates similar human factors principles into the development of Instructions for Use, onboarding, smart training devices, and packaging. “Through this collaboration we aim to help improve the patient experience, provide training to reduce administration errors, and help patients keep compliant with their prescribed treatment,” says Mr. Reynolds. With the increasing demand for combination products, it is essential to fully understand the interaction between the four key elements of an effective drug delivery system — the drug, the container, the delivery device, and the patient. Starting with the drug and container, it is becoming even more critical that the interaction between the two is fully understood to minimize interactions, reduce and control extractables/leachables, and reduce the presence of particles. Selection of the container should also be considered with regard to the final delivery method. West designed and manufactured the 1-3-mL NovaPure plunger using Quality by Design (QbD) principles to ensure dimensional control and consistency, sub-visible and visible particulate control, and low parts per million (ppm) defect attributes. Featuring optimized breakloose and glide force profiles, 1-3-mL NovaPure plungers are designed to deliver consistent functional performance for autoinjector applications across various injection volumes, including as part of increasingly common 2.25-mL injectable drug delivery systems, Mr. Reynolds says. 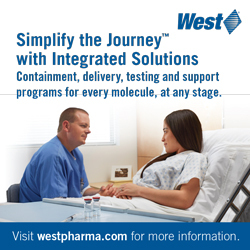 West partners with a number of customers to create integrated drug delivery systems that meet their needs for ensuring safe and effective treatment and help to improve patient outcomes. As one example, Amgen selected the SmartDose® technology platform for a new single, monthly 420-mg dose delivery option for Repatha® (evolocumab). 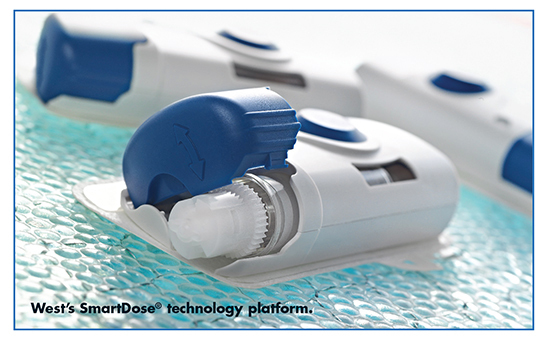 The SmartDose technology platform is an integrated solution of delivery and containment featuring a silicone-free Daikyo Crystal Zenith® cartridge and a Flurotec® coated piston containment system. Its design allows the dosage amount and length of time to be pre-programmed to the drug maker’s specifications. Beyond the actual delivery, the aesthetic features of SmartDose technology, such as color scheme, can be customized to maintain branding. In the world of self-injection devices, ergonomics is key to improve patients’ compliance. Ypsomed uses human factor engineering methods throughout the development cycle of its products. Examples of Ypsomed’s platform products are YpsoMate, the 2-step autoinjector, and UnoPen, a disposable pen, both of which have been tested for usability in extensive formative human factor studies on a platform level. “With these studies we prove the usability of our platform products, even before the implementation of further ergonomic modifications during the customization to the customer-specific product,” says Simon Michel, CEO of Ypsomed. To address the trend towards less frequent injections and increasing injection volumes, and higher payloads that need to be delivered in one injection, the YpsoMate 2.25 allows the injection of up to 2.25 mL and has enough power to inject viscous liquids within a short period of time. “Its two-step operation, and visual and audible feedbacks give the patient confidence in handling the device,” says Mr. Michel. 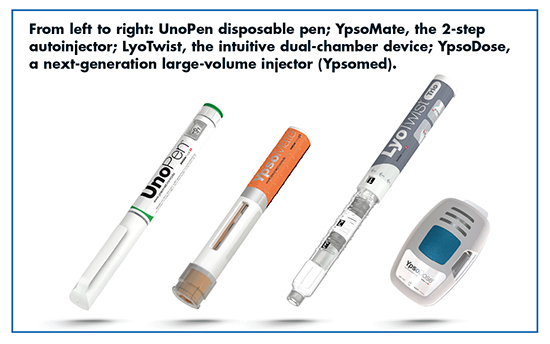 Ypsomed is also active in the new device class of large-volume injectors that complement pens and autoinjectors. YpsoDose is a prefilled, fully disposable, electro-mechanical patch pump that has an auto-insertion needle mechanism, a glass container with a sterile fluid path. YpsoDose covers the range of injectable volumes from 2-5 mL. Preparing and injecting a drug that is not liquid stable is a problem for self-injecting patients. Preparing the drug for injection requires the patient to perform a number of steps that are prone to handling errors. An example of a drug that is not liquid stable is long-acting GLP-1 as used by diabetics. Compared to daily-injected GLP-1, long-acting GLP-1 products are injected once a week, but need to be reconstituted before injection. To eliminate the difficult preparation steps, Ypsomed provides LyoTwist device technology for simple reconstitution. The key to the system is a dual-chamber cartridge that holds the lyophilized drug or drug powder and the solvent in separate compartments. With a simple twist, the drug is reconstituted and the air is removed from the system. The drug is injected by pushing the injection button. LyoTwist is available with manual or automatic injection and with fixed or customizable variable dosing. AstraZeneca and GSK both recently launched their long-acting GLP-1 products in customized versions of LyoTwist. 1. Research and Markets: Injectable Drug Delivery Market: By Devices, Therapeutics & Formulations 2015 – 2020, Sept. 30, 2015, http://www.businesswire.com/news/home/20150930006037/en/Research-Markets-Injectable-Drug-Delivery-Market-Devices. 2. The top 8 qualities that injectable drug delivery devices will have in the future, by Vangelis Papagrigoriou, Cambridge Consultants, November 24, 2015, http://blog.cambridgeconsultants.com/medical-technology/the-top-8-qualities-that-injectable-drugdelivery-devices-will-have-in-thefuture/.